What’s New for the 2015 Toyota Corolla? The Corolla was fully redesigned for 2014, so the changes to this model year are minimal. However, the 2015 Toyota Corolla does get a fold-down rear armrest in most trim levels, the exception being the base L model. Additionally, the Corolla’s “Premium” sub-trims get standard Driver Convenience packages, which include push-button start, Entune Premium Audio with Navigation, and App Suite. Toyota offers its 2015 Corolla in four different trim levels: The L, LE, LE Eco, and S. Standard on all models are features like LED low-beam headlights and running lights, 15-inch steel wheels, body-color power side mirrors, and body-color door handles. Upgrade to the LE or LE Eco and you’ll add fog lights, 16-inch alloy wheels, heated side mirrors, and a moonroof (the LE Eco also gets a rear spoiler and chrome-accented window trim). Finally, choosing the top-of-the-line S model will score you integrated turn signals in your side mirrors, a front chrome grille with piano-black surround, and 17-inch alloy wheels. 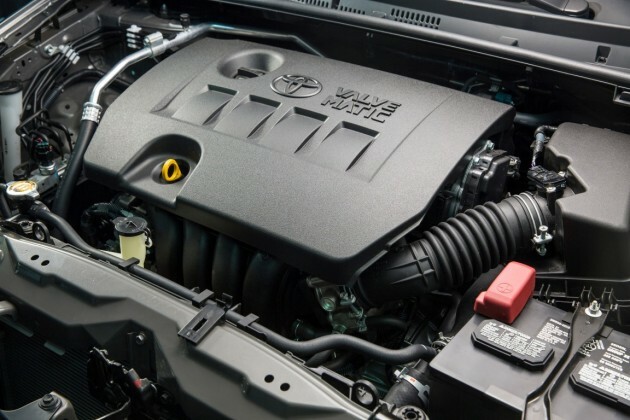 All 2015 Toyota Corolla models are equipped with 1.8-liter four-cylinder engines. The L, LE, and S engines come with dual variable valve timing with intelligence, while the LE Eco’s engine comes with Valvemetric technology. This additional technology allows the LE Eco to pump out 140 horsepower and 126 lb-ft of torque compared to the other models’ 132 hp and 128 lb-ft of torque. The base L model is driven by a four-speed automatic transmission, while the three other models are equipped with continuously variable transmissions (CVTs). A manual option is not available for any 2015 Corolla model. 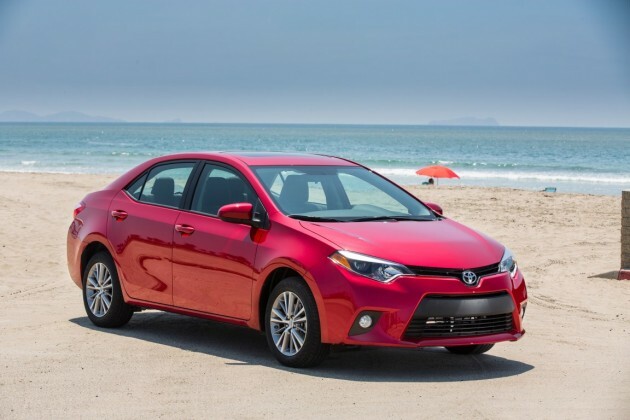 Efficiency is something that’s expected from subcompact cars, and the 2015 Toyota Corolla does not disappoint. Fuel mileage estimates for the Corolla L come in at 27 mpg city and 36 mpg highway. Upgrading to the LE (and that lovely CVT) increases those numbers to 29 city and 38 highway. The LE Eco is by far the most efficient (as one would gather from the model’s name) at 30 mpg city and 40 mpg highway, while the tricked-out S model gets 29 mpg in the city and 37 mpg on the highway. No wonder Corolla drivers look so smug at the gas station. One of the most desirable features of the 2015 Toyota Corolla is its impressive amount of rear-seat legroom. While most subcompact cars make back-seat traveling an extremely unpleasant experience, the Corolla’s 41.1 inches of legroom make the car appear more like a midsize sedan than an entry-level one. An additional plus for back-seat passengers is the flat floor, which makes riding in the back much more comfortable for whoever sits in the rear middle seat. 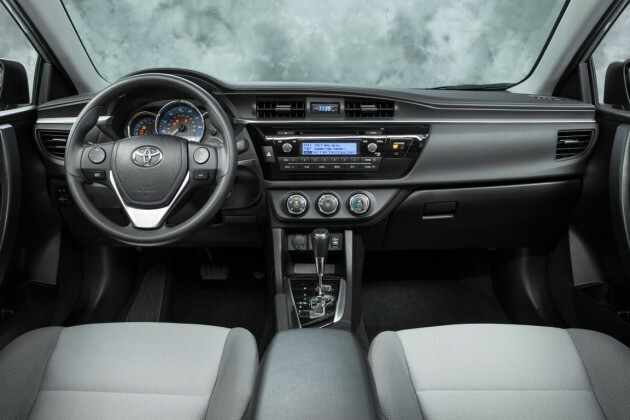 The Corolla’s interior design features an asymmetrical shifter surround, a sporty steering wheel, and easy-to-use audio controls. Toyota is dedicated to ensuring its vehicles achieve the best safety ratings possible, and the 2015 Toyota Corolla is no exception. The sedan earned five out of a possible five stars in NHTSA crash testing. While the 2015 model hasn’t been tested by the IIHS, it’s expected to be named a Top Safety Pick much like its predecessor. Standard safety features include front side airbags, side curtain airbags, a driver’s knee airbag, and a passenger seat cushion airbag. Additionally, the Corolla is equipped with stability and traction control, antilock brakes, and a rearview camera (standard on all trims except the base L).